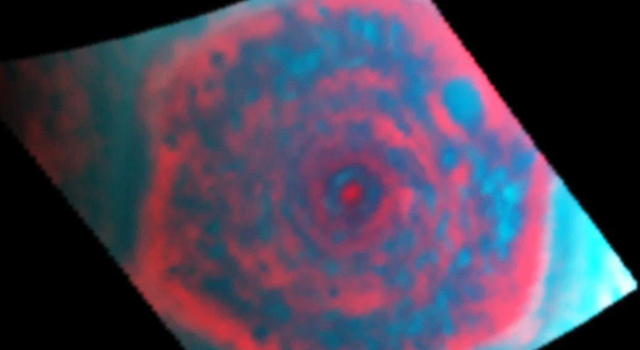 "The hexagon is just a current of air, and weather features out there that share similarities to this are notoriously turbulent and unstable," said Andrew Ingersoll, a Cassini imaging team member at the California Institute of Technology in Pasadena. "A hurricane on Earth typically lasts a week, but this has been here for decades -- and who knows -- maybe centuries." Scientists analyzed these images in false color, a rendering method that makes it easier to distinguish differences among the types of particles suspended in the atmosphere -- relatively small particles that make up haze -- inside and outside the hexagon. "Inside the hexagon, there are fewer large haze particles and a concentration of small haze particles, while outside the hexagon, the opposite is true," said Kunio Sayanagi, a Cassini imaging team associate at Hampton University in Virginia. "The hexagonal jet stream is acting like a barrier, which results in something like Earth's Antarctic ozone hole." The Antarctic ozone hole forms within a region enclosed by a jet stream with similarities to the hexagon. Wintertime conditions enable ozone-destroying chemical processes to occur, and the jet stream prevents a resupply of ozone from the outside. At Saturn, large aerosols cannot cross into the hexagonal jet stream from outside, and large aerosol particles are created when sunlight shines on the atmosphere. Only recently, with the start of Saturn's northern spring in August 2009, did sunlight begin bathing the planet's northern hemisphere. 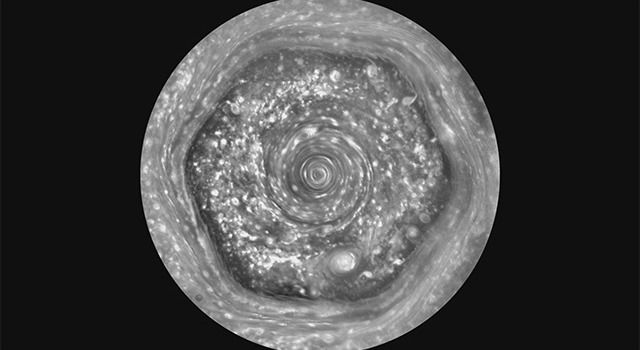 "As we approach Saturn's summer solstice in 2017, lighting conditions over its north pole will improve, and we are excited to track the changes that occur both inside and outside the hexagon boundary," said Scott Edgington, Cassini deputy project scientist at NASA's Jet Propulsion Laboratory in Pasadena, Calif.
A black-and-white version of the imaging camera movie and movies obtained by Cassini's visual and infrared mapping spectrometer are also tools Cassini scientists can use to look at wind speeds and the mini-storms inside the jet stream. Cassini launched in 1997 and arrived at Saturn on July 1, 2004. Its mission is scheduled to end in September 2017. The Cassini-Huygens mission is a cooperative project of NASA, the European Space Agency and the Italian Space Agency. JPL manages the mission for NASA's Science Mission Directorate in Washington. JPL designed, developed and assembled the Cassini orbiter and its two onboard cameras. 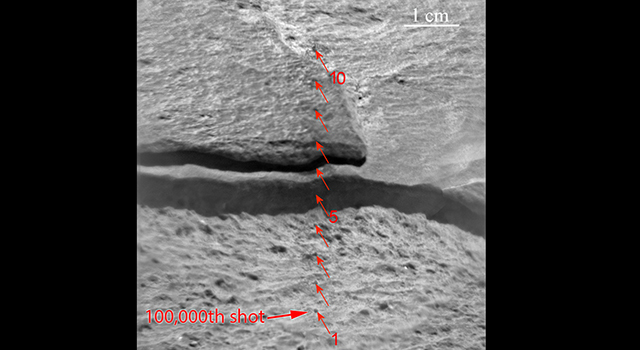 The imaging team is based at the Space Science Institute, Boulder, Colo.
A Google+ Hangout to discuss these results and other Cassini images will take place today at 12:30 p.m. PST (3:30 p.m. EST): http://bit.ly/askcassini . The event will be broadcast live on NASA Television and streamed on the agency's website. 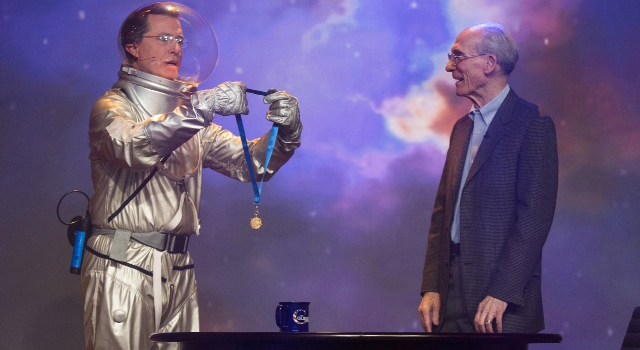 For information on NASA TV, visit: http://www.nasa.gov/ntv . The event will also be streamed live on Ustream with a moderated chat available at: http://www.ustream.tv/nasajpl2 . Questions can be asked on the Google Hangout event page, in the chat box on the Ustream site and via Twitter using the hashtag #askCassini.